Ice hotels are unique, destination hotels that can be found in northern climates. The notion of staying in an ice hotel may be a romantic one, but what are the cold, hard facts of staying in this arctic accommodation? The Quebec Ice Hotel (French: Hôtel de Glace, oh-tel de glass) is the only one in North America. Here is what you can expect during a visit to this memorable accommodation. The Quebec Ice Hotel is about 20 mins out of downtown Quebec City or about 30 mins from the Quebec City International Airport. The Ice Hotel itself is set just apart from a simple lodge where guests check in and leave belongings in a locker room. The temperature inside an ice hotel runs between -3°C and -5°C. Like an igloo, the 4-foot thick ice walls insulate the interior and protect guests from the wind. Tours of the Quebec Ice Hotel are available until the early evening, but ticket holders may stay on at the Ice Bar until midnight, after which the hotel remains open only to those people who have bought an overnight package. For an additional cost, tours can include transportation to and from hotels in Quebec City. As I hope my pictures reflect, the Quebec Ice Hotel is a unique, fairytale-like structure. The artistry and work that has gone into its erection are truly impressive, and the interior lighting gives the Quebec Ice Hotel a strange and glorious glow. All of this magic is best appreciated at night when fewer people are actually in the hotel. Tours stop in the early evening, the DJ amps it up, and the hotel is turned over to the brave souls planning to stay the night. Another advantage to staying at the Ice Hotel overnight? Don't underestimate bragging rights. 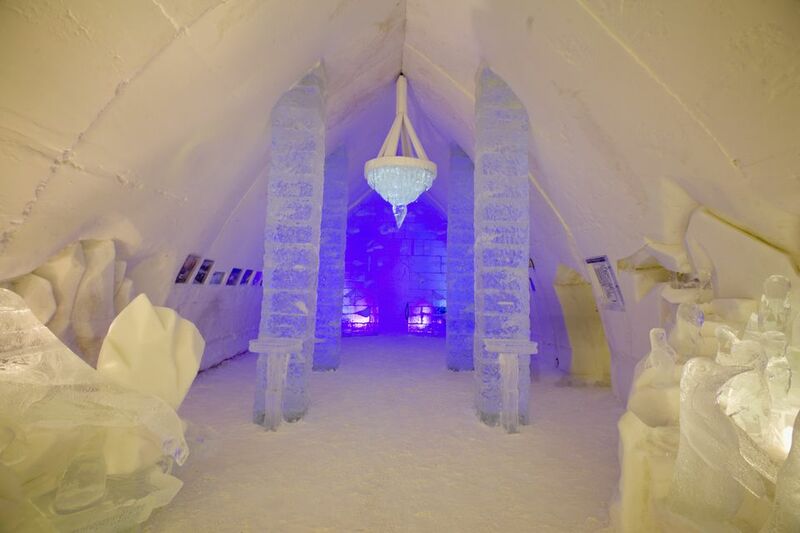 "I stayed at the Quebec Ice Hotel" is a statement bound to intrigue and impress. Staying overnight at the ice hotel is for hardy people who don't mind foregoing the comforts of a conventional hotel for the experience of sleeping in an upscale igloo. After a drink in the ice bar and a soak in the outdoor hot tub (however, not hot enough to warm us up), we moved to the sauna (thankfully, hot). Upon bedtime, we followed exactly the instructions as laid out earlier by Ice Hotel staff. I got into my sleeping bag, warm and dry and enjoyed 3 or 4 hrs of sound sleep; after this, even my -30°C North Face sleeping bag couldn't save me from the chill of the Quebec night and I arose cold and miserable. Certainly, there is a novelty and indeed a magic to staying in an ice hotel. I'm glad I did it. Would I do it again? Not a chance. Do I Actually Sleep on a Bed of Ice? Yes, but you are separated from the solid ice base by a wooden boxspring and mattress. What about Going to the Bathroom? A heated structure adjacent to the outdoor hot tubs and sauna has electricity, male / female changerooms, flush toilets, hairdryers and lockers. Do the Rooms have Doors? Lighting? Rooms at the Quebec Ice Hotel do not have doors, but do have a pull curtain for privacy. Noise does not seem to be a problem. Most people conserve their energy and retire quietly into the the hollow silence you would expect of an igloo. Beds have a light switch built right onto the bed for convenience. Meals - if they are included in your package - are served just up the road at the Auberge Duchesnay. The meals we had there were excellent. How Should I Prepare for Staying at the Ice Hotel? First decide whether a night at the Ice Hotel is really something you want to do, or is it just a romantic notion. I saw some shivering, shell-shocked people in the locker room and lobby at 6 am, who, when I talked to them, were just not versed in the realities of staying overnight in an ice hotel. Remember, a tour and a drink at the Ice Hotel is an option (and there's a glorious and warm lodge just a stone's throw away from the Ice Hotel for accommodation). If you decide that staying at the Ice Hotel is what you want, check out the promotions and packages available online. Most packages include a delicious dinner and a room at the neighbouring Auberge Duchesnay (a kind of insurance policy against the cold). Promotions are more bare-bones. What's Included in Staying at the Ice Hotel? What is the Cost? Promotions and packages vary in price and in what they include. Overnight stays include an Ice Bar cocktail, access to the *hot* tubs (not too hot the night we were there!) and sauna, gear to sleep in the Ice Hotel rooms (thermal sleeping bag and camping pillow) plus instructions on how to stay warm, and hot morning beverage. Many promotions also offer a hot breakfast at the Auberge Duchesnay, just a 3-minute walk up the road. Packages are more comprehensive in their offerings, including a room at the Auberge Duchesnay - either as back-up or primary accommodation - and dinner at the Auberge restaurant. Packages generally have themes, such as romance or adventure. Rates run from about CAD$200 - over $500 per night, per person plus taxes, and you can book on TripAdvisor.